Although the new generation consoles has a library full of great exclusive titles like The Witcher 3: Wild Hunt, Batman: Arkham Knight and Bloodborne, there's no denying that, in fact, the number of remastered games are even greater. While many re-releases are questionable for not offering anything new, besides the resolution and high frame rate, other games stand out with unpublished elements added to the original material. Check out the list of the best re-releases for PlayStation 4 and Xbox One . The famous open world game from Rockstar starring Franklin, Michael and Trevor, received special treatment, in addition to visual improvement. The first-person mode, in which you can venture out on Los Santos online and offline in a new light, provided a very different experience for players already familiar with the game. The addition of the way in first person, along with new musical playlists, well crafted textures, refurbished lighting effects and resolution at 1080p, made GTA 5 of PS4, Xbox One PC and the definitive version. 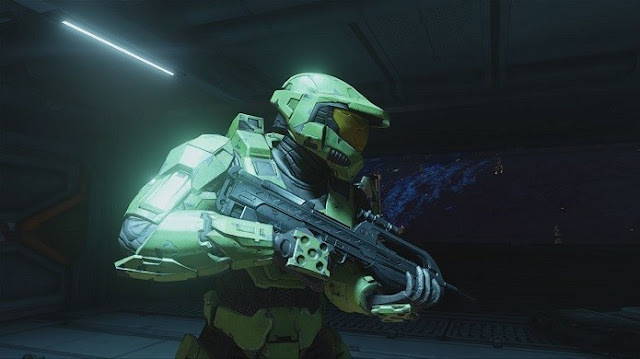 The unique build of Xbox One, which includes the classic games starring Master Chief, perhaps the most valuable remastering thus far. This is because the robust package offers repaginate versions of the main games of the franchise and their multiplayer modes. Running at 1080p and 60 fps, the cutscenes were adjusted and the gameplay was glaring changes, such as lighting adjustments and modeling of characters and objects, including facial expressions of the characters. Also, the sound effects and track songs were reworked to keep the futuristic essence that the consecrated host. Considered by many specialized sites as one of the best exclusive games from Sony, even in 20 years of existence of the PlayStation brand, The Last of Us is a difficult title to be improved, precisely because it is good enough. However, Naughty Dog knew perfect as anyone what was already practically perfect and brought a better game running at 1080p and 60 fps, in addition to engaging expansion Left Behind inserted in the package. The multiplayer is also present to satisfy the most strategic competitive games fans. After 20 years of the launch of the original version of "Terror father," the classic Resident Evil resurfaced as a reworked edition of the GameCube, which hit stores in 2002. The experience as a whole remains intact, but the gameplay was optimized with Modern handling and more precise controls. Graphically, the aesthetic change is absurd, since Capcom has implemented textures and refine the modeling of the enemy, and with mastery translate the elements dedicated the masterpiece of horror. Even if some mechanical have aged badly, there is no denying that Resident Evil HD Remaster still scary. The final version of the title of From Software may have been polished in every way, but the journey remains complex and punitive. In Dark Souls 2: Scholar of the First Sin, the player is able to enjoy all the additional content (Crown of the Sunken King, Crown of the Old Iron King and Crown of the King Ivor) previously released as well as the original story. Dark Souls 2 HD also brings significant changes to the gameplay, such as refined artificial intelligence and a new positioning system of enemies. The reign of Drangleic was rebuilt with new challenges and relevant visual enhancements, introducing textures in high resolution. Remember that Scholar of the First Sin runs in 1080p and 60 fps in both platforms. Say collections "next-gen" are always welcome. This is because the player did not have the opportunity to venture into the game during the launch period, you can purchase the full content running in 1080p and 60 fps for an amount greater account. Although not contain the first title in the series, Borderlands: The Handsome Collection lives up to the name that carries to offer Borderlands 2 with all the DLCs, which represents hundreds of hours of gameplay. The compilation also presents the user with Borderlands: The Pre-Sequel , the latest franchise game, which established itself with new and innovative mechanical, such as low gravity. Devil May Cry 4 Special Edition is not content to be just a prettier version of the classic. The new edition of the popular game action adventure starring Nero and Dante includes three characters from previous games (Vergil, Trish and Lady), a turbo mode to amplify the speed of gambling and the insane mode Legendary Dark Night, inherited from the PC. With a much more inviting look and running at 1080p and 60 frames per second, the fluidity in the gameplay is sharp and facilitates the execution of more elaborate combos. Although some mechanical are obsolete, the Special Edition features new experiences that go beyond the visual enhancements. Released exclusively for PlayStation 4, God of War 3 Remastered marks the first appearance of Kratos in the new generation console from Sony. The adventure follows the journey of the War God of vengeance is beautiful, as it can run perfectly in 1080p and 60 frames per second. The fluidity of 60 frames per second makes the gameplay much more accurate and visually stunning, with many elements present on the screen at once, without any occasional crash. however, God of War 3 Remastered is weak because there is nothing new in terms of content. On the other hand, technically speaking, is one of the best remasters available. Tomb Raider is undoubtedly the best of the heroine game. Originally released in 2013 for PlayStation 3, Xbox 360 and PC, Lara Croft adventure was one of the first remasters to land in next-generation console. Running at 1080p in both games, the final version of the reboot introduces new layers of textures and additional content focused on multiplayer mode. The adventure game point-and-click with comedy and noir climate history was recreated by Double Fine, under the direction of genius Tim Schafer. Fortunately, the essence of Grim Fandango remained untouched to bring back Manny Calavera and other characters full of personality. Launched in 1998, the game was marked by dense narrative, consisting of humorous dialogues and references in honor of the Day of the Dead. The visual received special treatment, with textures in high resolution and re-recorded audio. It sure is a classic that deserves to be revisited.